…according to our experiences, that is. 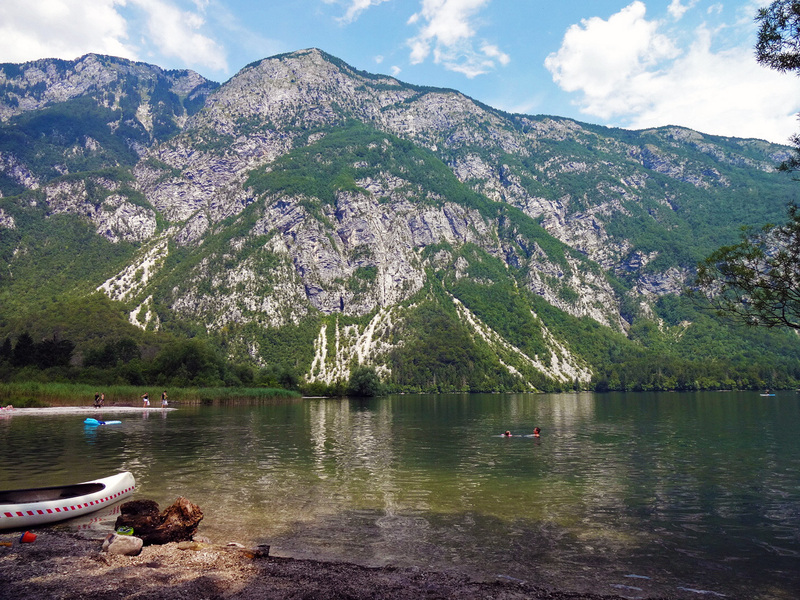 Only 30 km away from its more touristy neighbour, Lake Bled, Lake Bohinj is much more than only a swim-inviting waterbody surrounded by picturesque Alpine mountains. It’s a popular spot with locals, whether they come for a refreshing swim or a (probably exhausting) climb up the slopes of the mountains. The largest glacial lake of Slovenia lies in the heart of the Triglav National Park, the only national park of the country. 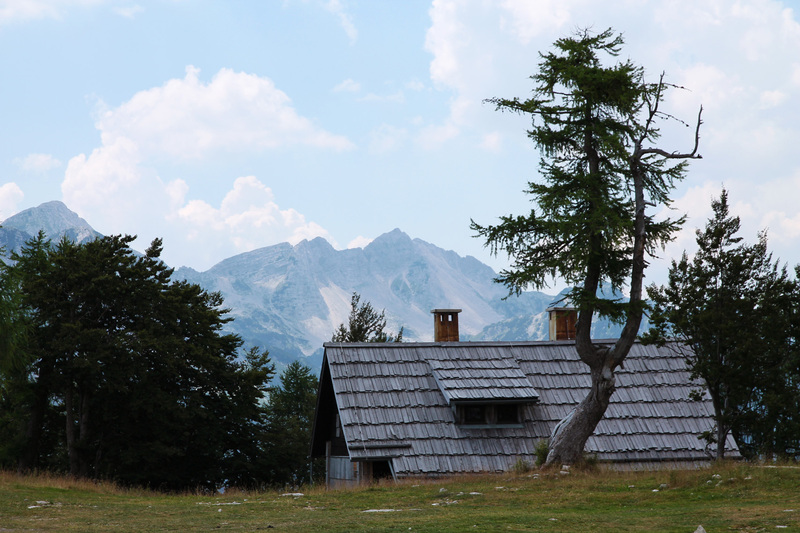 The highest peak in the Julian Alps, Mount Triglav, is located in the centre of the park and is a national icon. 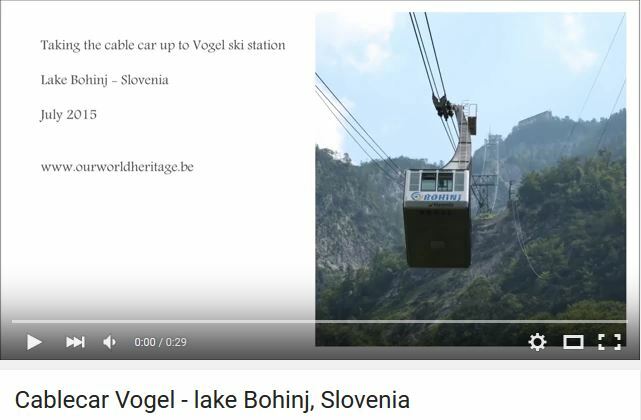 It can even be found on the flag of Slovenia! 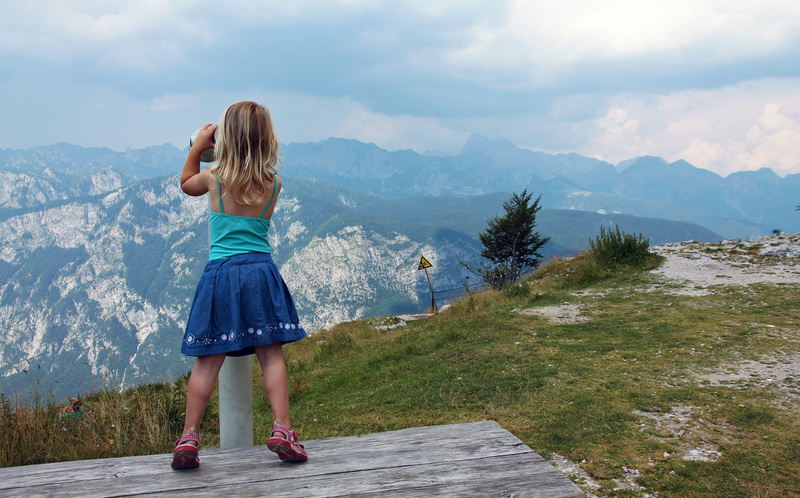 The Triglav NP area has a lot to offer, and it’s worth visiting for all types of traveller. 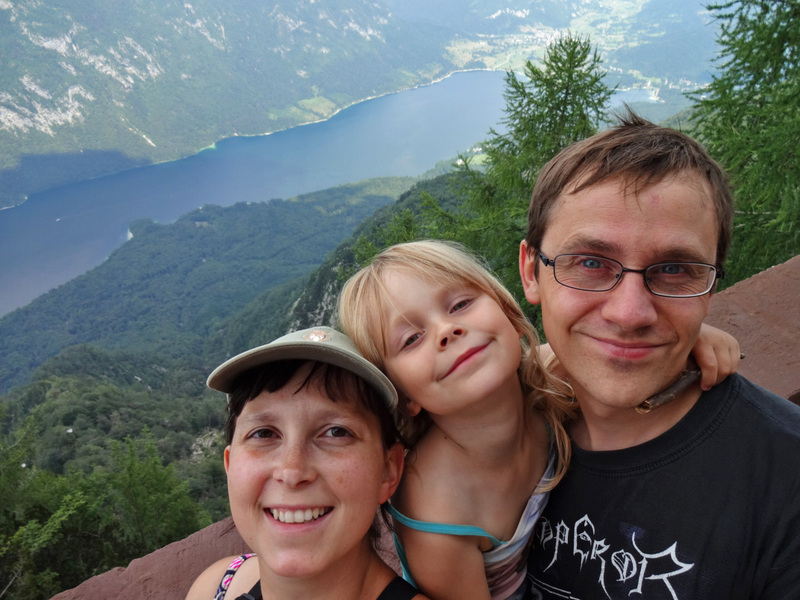 We arrived in Ribčev Laz, at the eastern tip of the lake, with our five-year-old in the backseat, our bikes attached to the trunk and lots of anticipation in our minds. There is a large parking area on Stara Fužina road, which is where we started our journey. So I start with something we didn’t do, simply because we only realised afterwards that the church of Ribčev Laz was worth a visit. This 13th-century church, dedicated to St. John the Baptist, is part Romanesque, part Gothic, and with a Baroque bell tower. Its interior is richly decorated with frescoes from different time periods, the oldest dating back to the 14th century. The façade of the building has a large painted image of St Christopher, the patron Saint of travellers. Another church in the vicinity, the Holy Spirit Church, is from the 16th century and stands near the southern edge of the lake. Spire of the church of Ribčev Laz. We brought our own bikes with us, all the way from Belgium. 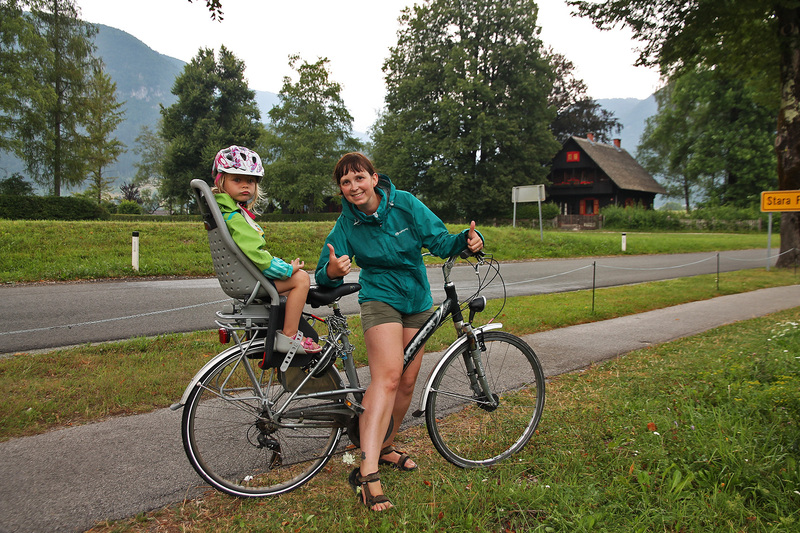 We reckoned biking would be the perfect transport method to bring us from Ribčev Laz to the western part of the lake: relatively quick, easy to stop along the way and a healthy alternative for the car. Moreover, we imagined the road along the southern edge of the lake to be relatively flat, since it’s so close to the water. It wasn’t. I should explain here that my bike is a second-hand, rusty and weathered dinosaur. Annick’s bike is much more recent and sophisticated, but it’s incredibly heavy. The trip turned out to be much longer and much more exhausting than expected. Especially the stretch between Vogel and Slap Savica was difficult to cover, since it’s so hilly. But in the end, we made it until the very western tip of the lake, stopping along the way for a few activities and to take in the scenery. The fearless bike-girls, ready to go. You won’t be alone in the water, but when we arrived (before noon), it wasn’t too crowded either. 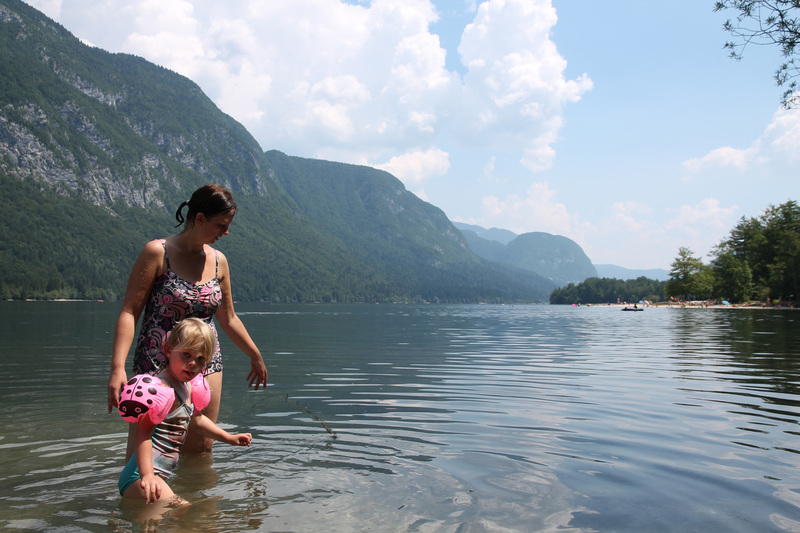 The easiest (and busiest) option is to access via a campsite (Camp Zlatorog Bohinj) at the shore. The water is super clear, so it’s perfect for snorkeling between the waterplants, with trout abound. 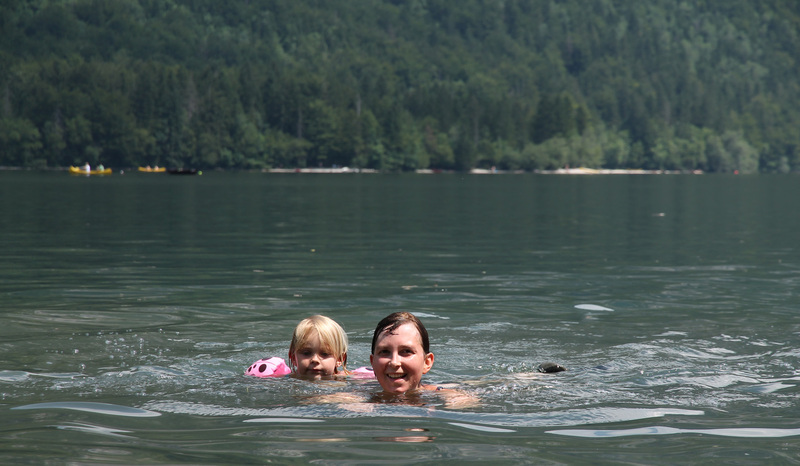 Swim to the center of the lake, relax and look around you: 360° of Alpine splendour! We bought a loaf of bread and some sausage in the supermarket of Ribčev Laz, and had a very enjoyable lunch on the beach, with the best backdrop you could wish for. Happy swimmers, with a view! 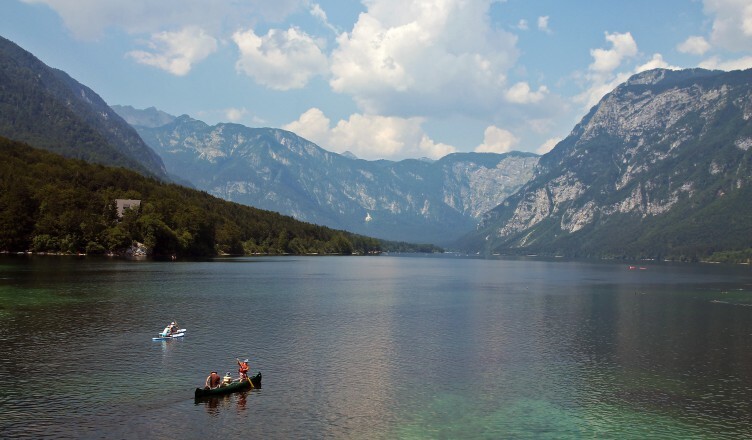 Lake Bohinj is postcard material…! 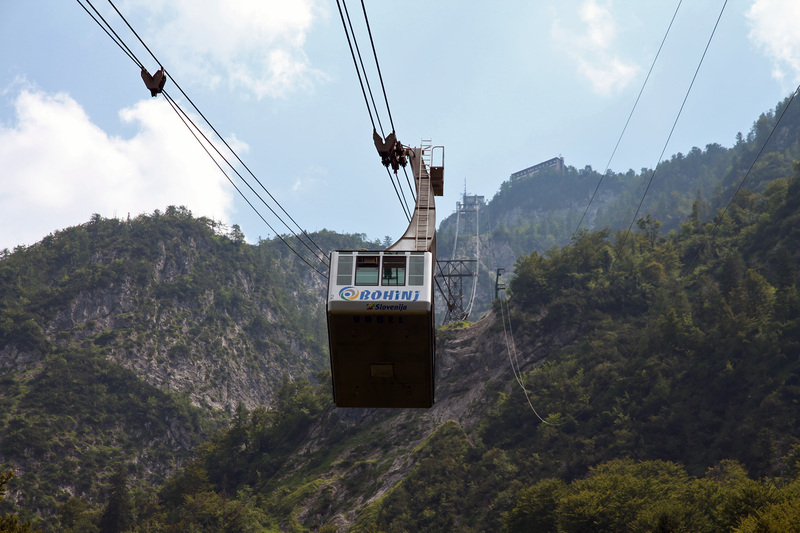 The Vogel cable car: pretty steep! 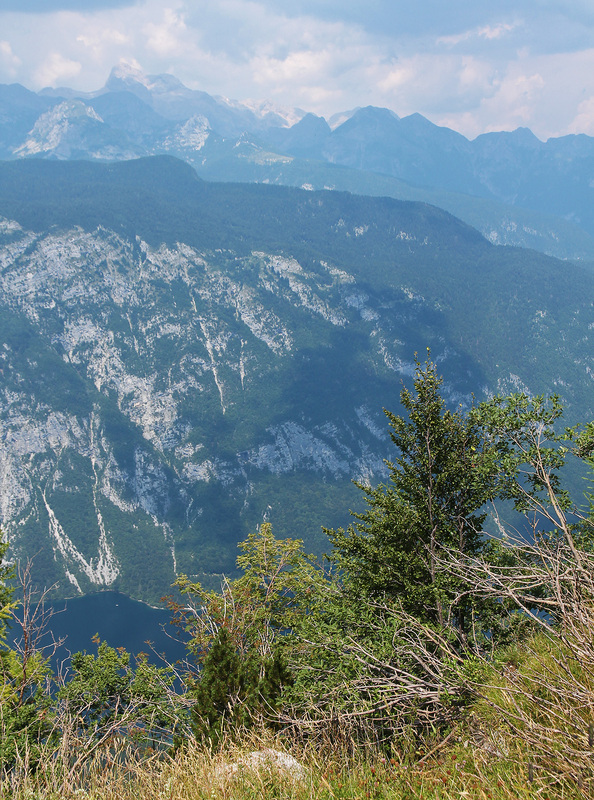 View from 1540m up the mountain, featuring the lake and Mount Triglav. Febe exploring the Alpine environment. 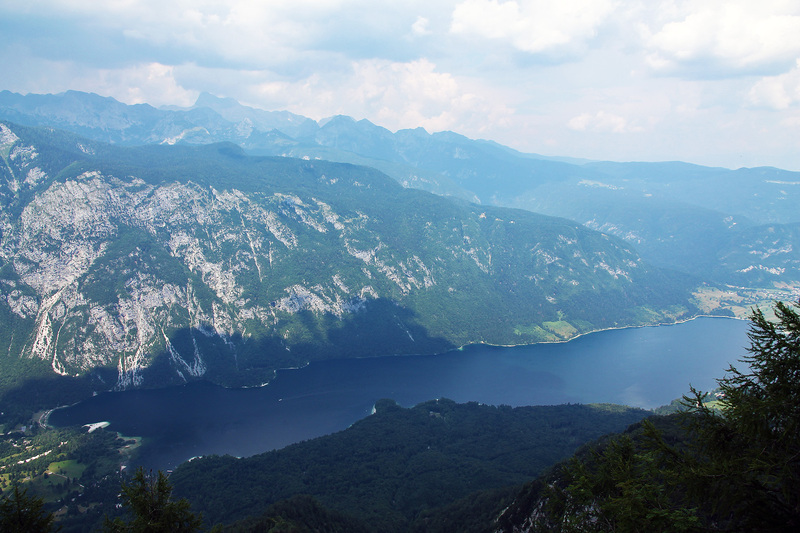 Lake Bohinj, and Ribčev Laz on the right side. 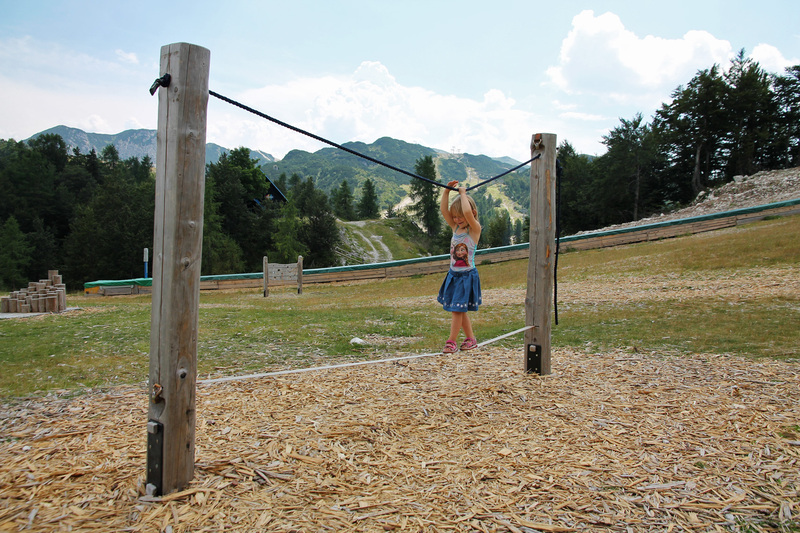 Febe enjoying the local playground. 5. Hike up to the waterfall. 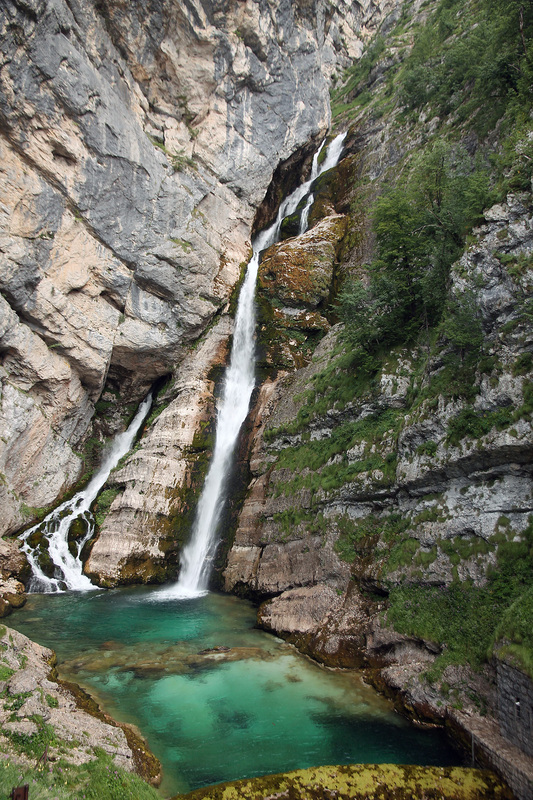 From the village of Ukanc, the road (4km) takes you to the starting point of the hiking trail that takes you up to Slap Savica (about 30′ walk), a waterfall that cascades 78m into a crystal clear pool below. It isn’t very high, but it’s a nice spot and the marked trail through the forest and along the river Sava Bohinjka is worth the effort. 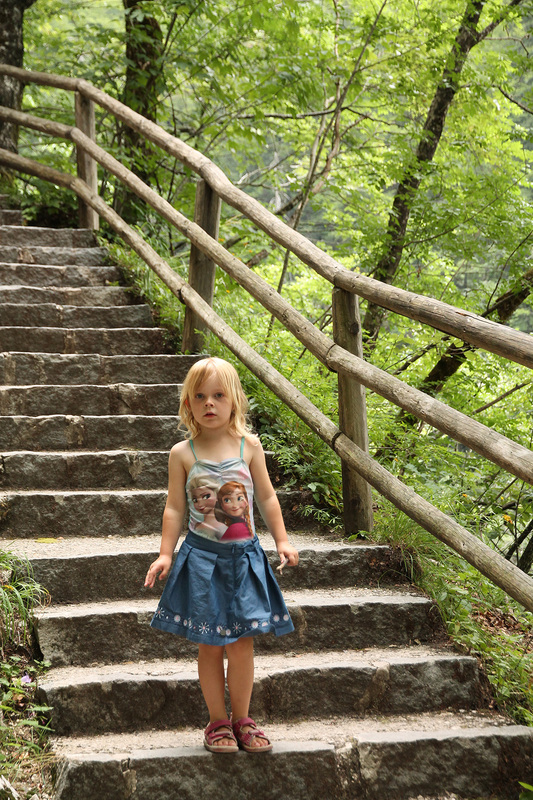 Ready to walk the stairs up to Slap Savica. 6. Get a taste of rural Gorenjska. 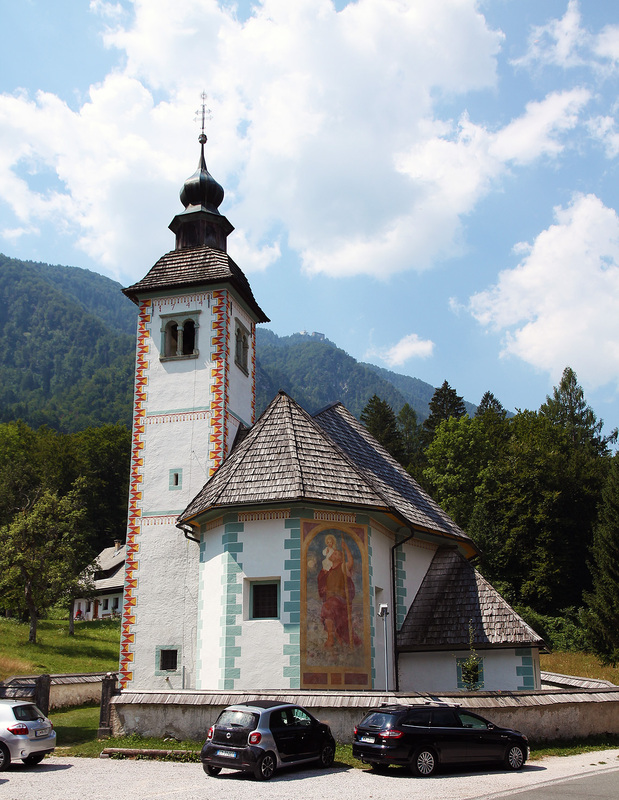 The Gorenjska region might be the most popular destination in Slovenia. 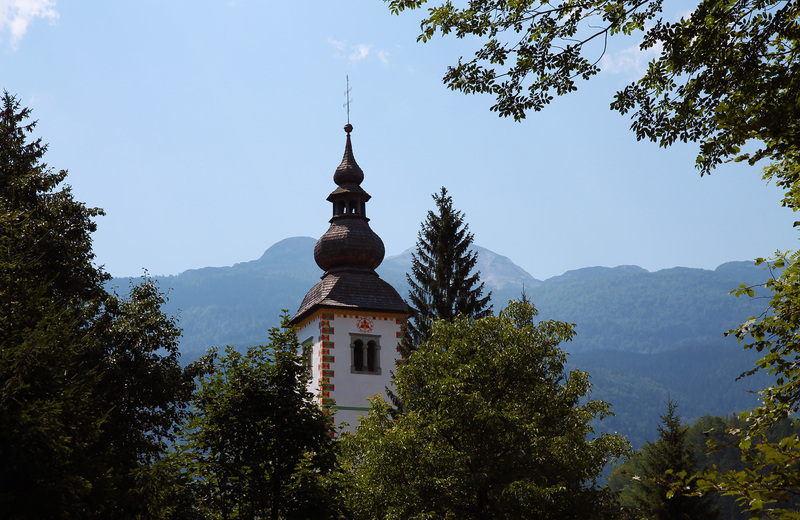 The two major lakes (Bled and Bohinj) are the major tourist-magnets here, as well as the ski resorts in winter time. 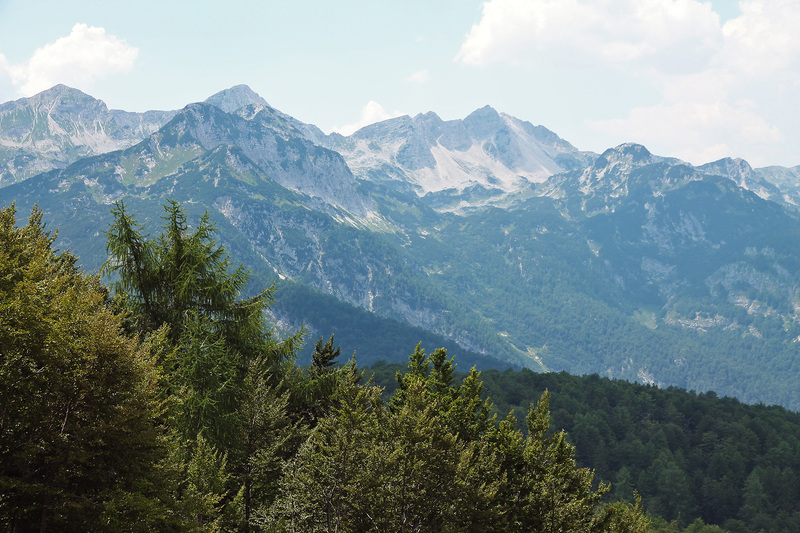 In summer, this Alpine area is best for hiking and mountaineering in a magnificent setting of mountains and meadows. Farming is the most important activity here. 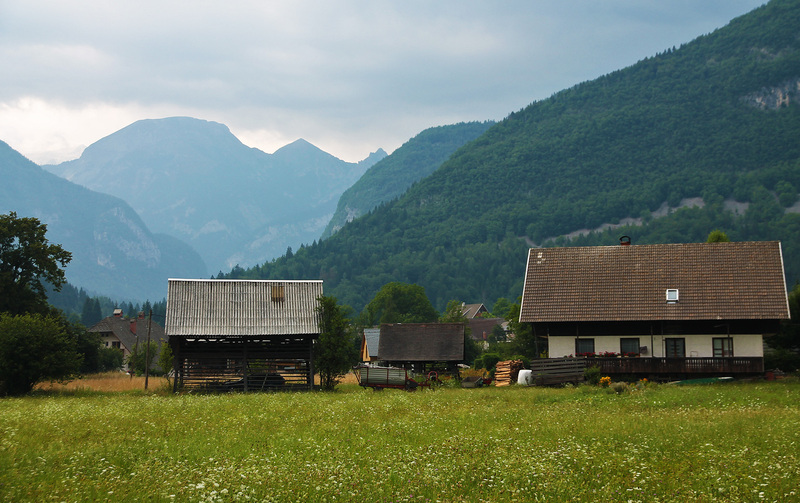 The traditional alpine village of Stara Fužina, consisting of a number of old farmhouses, is on the tentative list of UNESCO to become a world heritage site, together with its neighbouring village Studor and the pastures in the Fuzina Hills. Personally, It didn’t strike me as very unique, as I’ve seen many picturesque agricultural villages in the Swiss Alps that had a lot more character and were even more charming… Nevertheless, the area is certainly beautiful enough for a short detour. 7. 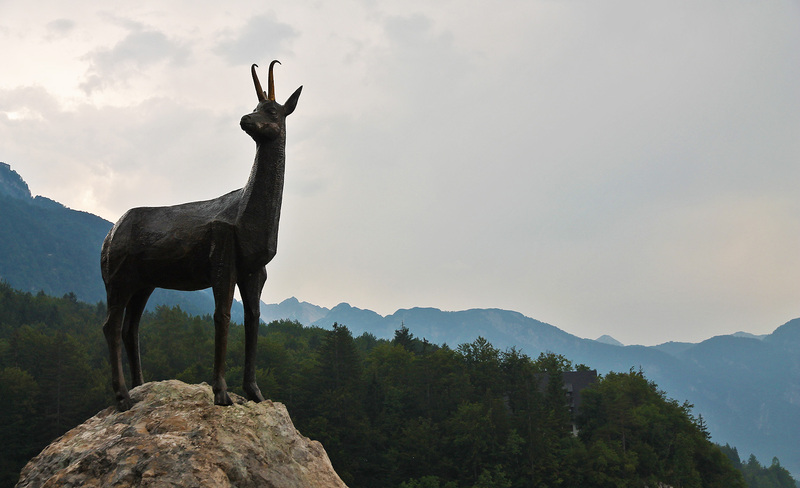 Pay tribute to Slovenia’s most famous Chamois. 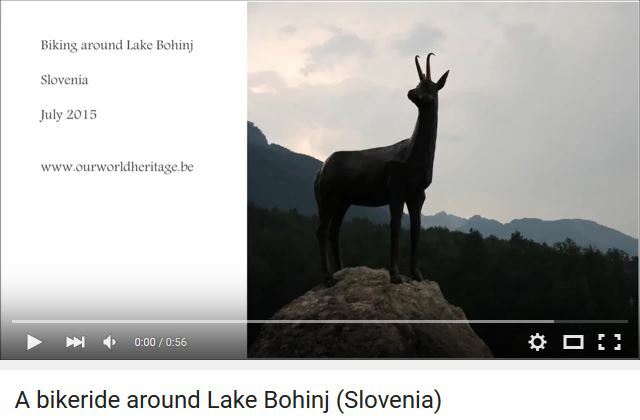 The legendary chamois buck Zlatorog (Goldhorn) is so beloved in Slovenia that it is even featured on bottles of Laško Pivo, the country’s most important brand of beer. According to the story, a young hunter tried to kill the animal to steal its golden horns as a present for the girl he loved. He shot Zlatorog, but where the animal’s blood touched the soil, magical Triglav flowers started to grow. Once Zlatorog ate one of the flowers, he healed immediately and pushed the hunter from the mountain. 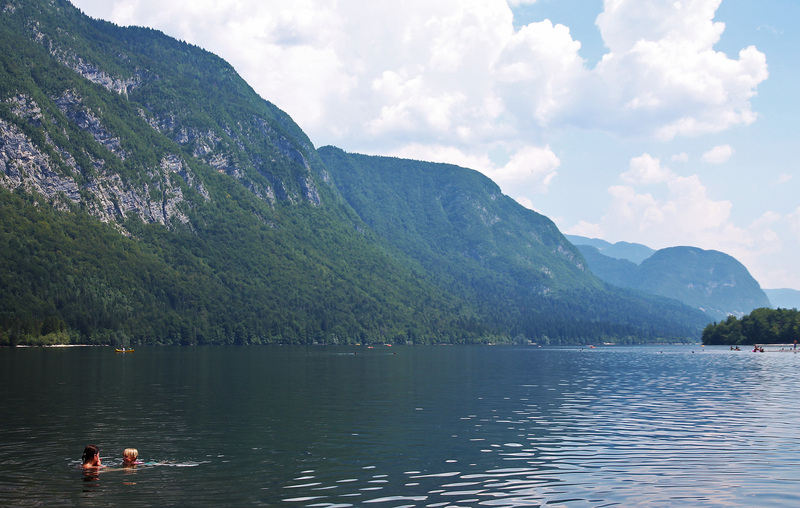 The statue of Zlatorog on the shore of Lake Bohinj is very popular with tourists ànd locals. Mighty Zlatorog, protector of the Triglav mountains. To honour the Roman deceased in Šempeter… and go for and afternoon swim in Laško.